It’s been an incredibly long time since I’ve written. Since I last posted, we were in Cuenca for a week, and Semana Santa has come and gone (the week before Easter), which is a big and crowded holiday on the coast; there was a huge surf tournament in Montanita the following week; we’ve been meeting with architects regarding plans for the house we are getting ready to build on our lot, and my youngest daughter and family came for a visit (I’ll write about that in my next post). The 2013 ISA World Masters Surfing Championship was held in Montanita from April 6-14. Twenty national teams (from all over the world) were represented, with around 150 participating athletes. See the International Surfing Association link here to see more details and the results. The waves and weather were perfect for it, and turned out to be a lot of fun! Todd and I had a great time going to the contest during the final two days. The throng that came was a wonderful, international crowd of all ages, and true surfers...dedicated to the gnarly break, and chilling out. For sure, it was a cool and mellow crowd of people who did come, and I hope Montanita hosts events like this again. My visiting son-in-law, Pedro (who is from Brazil) was thrilled to meet the Brazilian team one night while having dinner in Montanita, and had his picture taken with them. My son-in-law, Pedro (in the red shirt) and Kacie with the Brazilian team. Photo courtesy of my daughter Kacie's camera album. Around 35,000 to 40,000 folks were expected to attend. I don’t think the crowds were quite as big as expected. 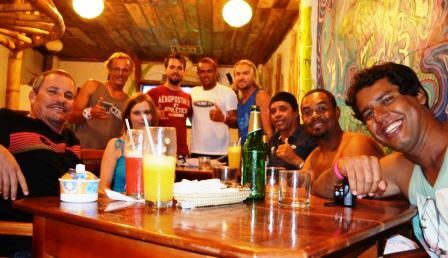 They were here, but most of them must have stayed/partied on the point, at the hostels there (a cool barrio where the surfing contest took place, and around a 5 minute beach walk from the town of Montanita). the flag on this one? Montanita proper was unusually tamer than normal, considering all the people that were here – but then again – there was a very visible security and police presence everywhere, including in Olón. There was some overflow into Olón. That being said, there was an incident about 10 days prior that marred the surfing event. 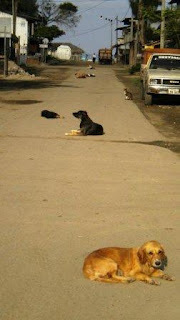 We were in Cuenca when we started getting frantic emails and phone calls from our coastal friends alerting us to the fact that “some people/entity” were picking up all the dogs running loose in Montanita and surrounding towns. Yes, it is true that the stray dogs are occasionally “culled”/euthanized here, generally using poisoned meat. But there is also a generous amount of time given beforehand via signs and announcements, so that pet-owners can keep furry family inside. In this case, many around here feel that not enough notice was given, and that it was heavy-handedly carried out. No one entity (i.e. the “communas” – coastal town city councils, for lack of better description) is claiming responsibility. Lots of finger pointing, lots of different stories (though no one thinks the ISA event organizers condoned or knew of the action) but the fact is that several pet dogs, obviously well-fed and wearing-collar dogs were picked up as well. The smaller dogs and puppies were found dumped into a dumpster in the town of Palmar (about 15-20 minutes south of Montanita). The local volunteers for the PAE (Protección Animal Ecuador”) came and humanely euthanized the surviving little ones. The larger family-owned pets (3-6 of them, depending on who you talk to about this) have never been found. Major consensus is that they were dumped live into the sea. We live in Olón. We adopted a 7-8 month old beach stray almost 3 years ago. Her name is Daisy. She is a very much loved member of our family, and a beloved mascot of our neighborhood. Many of you who have visited our area know her. She runs free, as do most all the dogs in our area. About the only dogs on leashes in town are those brought here by the gringos….expat dogs, if you will. Daisy wears a collar, and everyone in town knows she belongs to us. She is very independent; she knows how to take care of herself. We have taught her to stay out of trash, not beg from tables, and she is not allowed inside (with a few exceptions, like firework nights, -which terrify her - and then, only inside our house or Doug and Pam’s place). As a former stray, she could never be restrained to a leash, nor shut up in a yard. She would hate that, and she would not be the wonderful dog we all know and love if she was restricted in that way. You can take the stray off the beach, but you can't take the stray out of the dog....That is just the way it is here. But during this recent culling of town dogs, some collared, obviously well-fed, well taken care of pet dogs were picked up (including dogs in yards) and evidently destroyed. Daisy could have been one of them. Since we were in Cuenca when this happened, we are very fortunate to have friends in Olón who were quick to find her, and put her in a safe place during our absence. The irony of all this to me is that the day before we left for Cuenca (on a Wednesday afternoon, and the calls/emails about dogs being picked up started coming in on Friday), I discovered a flea infested, mortally ear-cancer ridden dog laying in the corner of our bedroom as I was packing. At first, I actually did think he was dead, based on the flies and the vomit-inducing, putrid smell in the room. I guess he quietly snuck in while I had our front door was open for a breeze. Once I got over my alarm at finding him there, and determining that he was still (barely) alive, I literally stood there and scratched my head and chin trying to figure out this one. What to do? A truly WTF moment. I mean, I didn’t want to hurt the obviously fatally ailing dog getting him out of my bedroom. I also did not want to get bit in the process. As luck would have it, a couple of Ecuadorian girlfriends came by for a completely different reason about two minutes later. I was still in shock, and waved them on into the bedroom. Then we all stood there and WTF scratched our heads and chins. EC GIRLFRIENDS: “Beats the hell out of us”. ME: “Yeah, but the police are nearby. Can’t we go get them, and MAYBE ask them to remove it? The EC GIRLFRIENDS apparently agreed with what I said about shooting the dog, but shrugged about the likelyhood of the local police agreeing to off the dog with a gun. No one knew where the town vet might be found at the moment. Eventually, one of these Ecuadorian girlfriends managed to gently “sweep” the dog out of the house with a broom. He then staggered over to Daisy’s outside water and food bowls (dripping copious, vile brown cancerous ear liquid along the path to it, inside and out). I chose first to bleach the ick from the house and dog bowls, since Daisy was with me (and Todd was in an out-of-cell-phone reach area), though I did try and call him first, leaving a message similar to “HOUSTON, WE HAVE A PROBLEM HERE” kind of voicemail. I went to find that poor dog after dark with a flashlight (figuring he wasn’t able to make it far), but did not find him, and now can only hope he didn’t die buried alive in a dumpster or drowned. It might be difficult for some reading this to reconcile “leaving out the poisoned meat” method of euthanizing sick and homeless animals as an acceptable way to eliminate them, but that is the way it sometimes works here in coastal Ecuador. Fortunately, organizations like PAE are making a difference, and worth supporting. I for one hope the people responsible for this particular dog round-up are held accountable....and thrown into dumpsters or out to sea to drown as they did to those dogs. * There is still much Montanita refuse-related problems to be addressed, and work has resumed on the sewers after the World Masters ended. The Montanita dog round-up and the on-going Montanita sewer system flaws did recently spawn a number of Ecuadorian national newspapers articles about the issues.